Most of us with an interest in tarot cards naturally tend to have an interest in other forms of cartomancy (that is, divination by cards) as well. Packs of fortune telling cards have been around for decades. The Gypsy Witch deck, for example, is pretty much unchanged in design for a century. Usually the decks have 52 cards, like a standard deck of playing cards. The faces have pictures, along with a title. This card shows a person thinking; the card is labeled "Thought" in English. If this card was placed before a card showing "Travel," it would mean the person for whom the reading is being done is thinking about traveling. If the next card was "Love" then the person might be thinking about traveling to see a loved one. You get the idea. Simple, I know, but simple isn't always a bad thing. Fortune telling cards are smaller than tarot cards, and often smaller than standard playing cards. They're fun to play with, relatively inexpensive to collect, and a sure conversation starter wherever you take them. Of the five decks listed below, one - the Gypsy Witch deck - is manufactured by the US Playing Card Co. 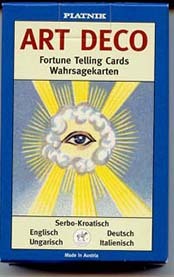 The Sibilla Oracle Cards are manufactured by Lo Scarabeo of Italy, and the other three are manufactured by Piatnik of Austria. One other note of interest: I've seen most of these sets offered on eBay at one time or another, going for more than the price of new decks! Usually the description is something like "I found these fortune-telling cards when I was cleaning out my grandmother's attic. I have NO IDEA how old they are, but they look like they're really . . . " Yeah, right. My guess is that most of these people have never been anywhere near their grandmother's attic. Caveat emptor.